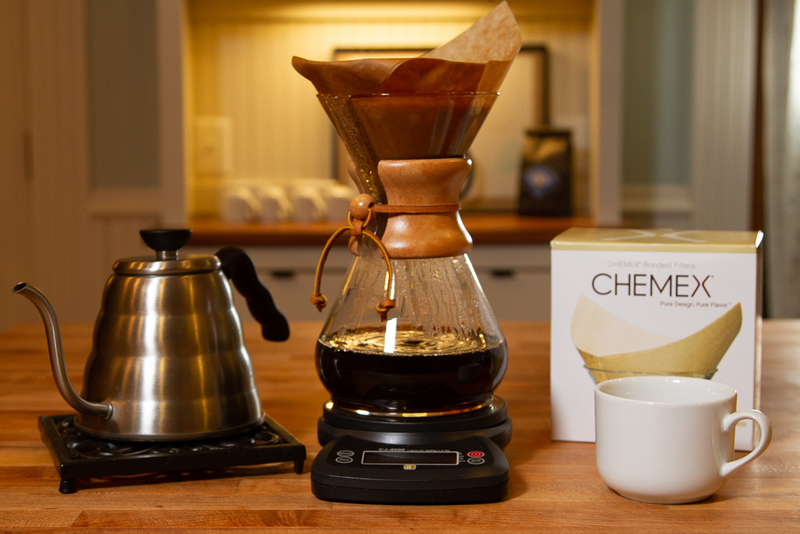 The Chemex Coffeemaker is a manual, pour-over style glass-container coffeemaker, invented by Peter Schlumbohm in 1941, and which continues to be manufactured by the Chemex Corporation in Chicopee, Massachusetts. 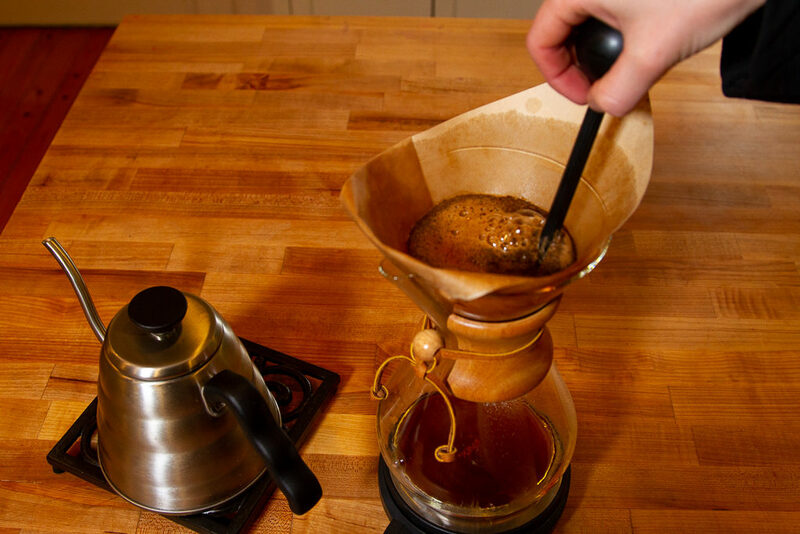 In 1958, designers at the Illinois Institute of Technology said that the Chemex Coffeemaker is “one of the best-designed products of modern times”, and so is included in the collection of the Museum of Modern Art in New York City. 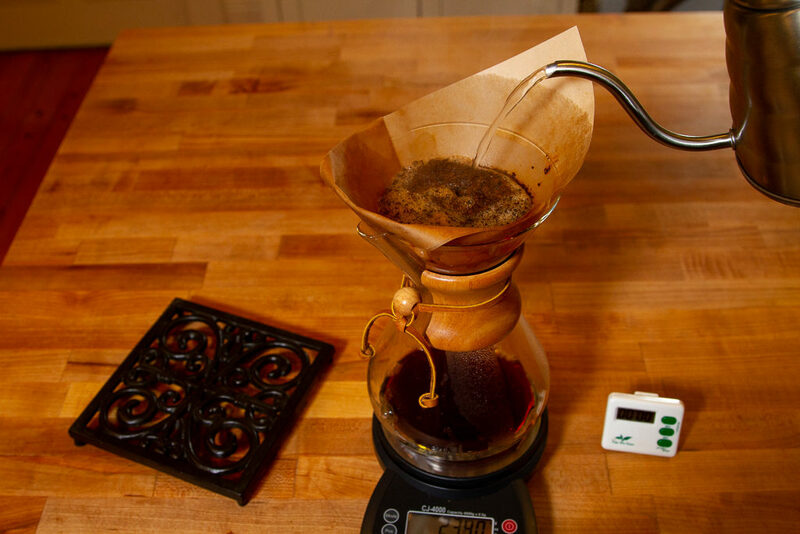 Put your Chemex filter with the single fold away from the spout of your brewer. Then, go ahead and use your hot water to rinse the entire filter. 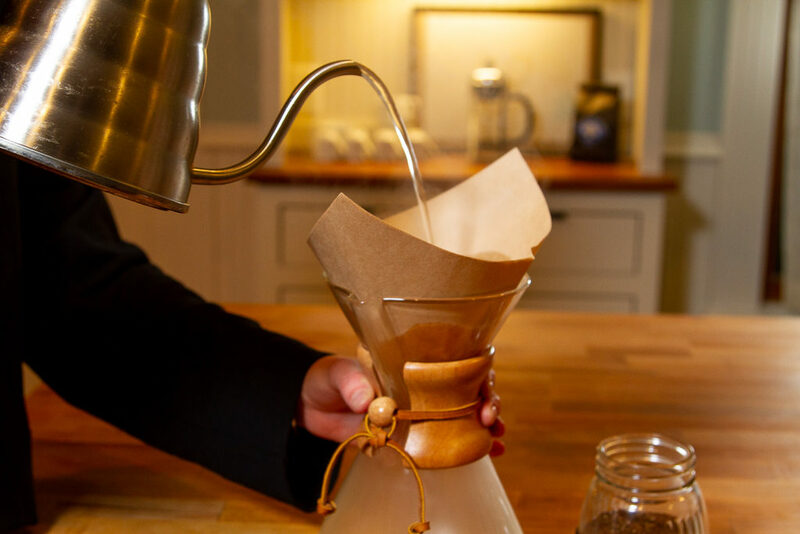 This will remove any paper filter taste and also act to warm up the chemex for the best extraction during the brewing process. 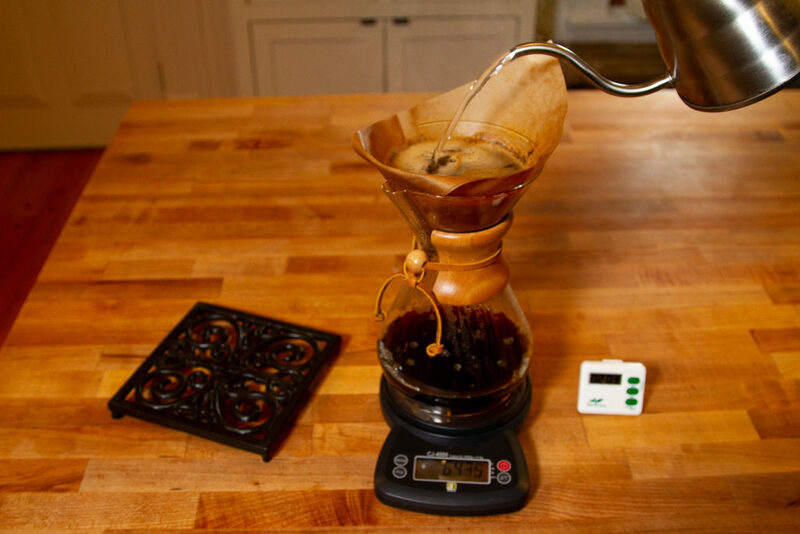 Go ahead and dump out the water and place your chemex on your scale. 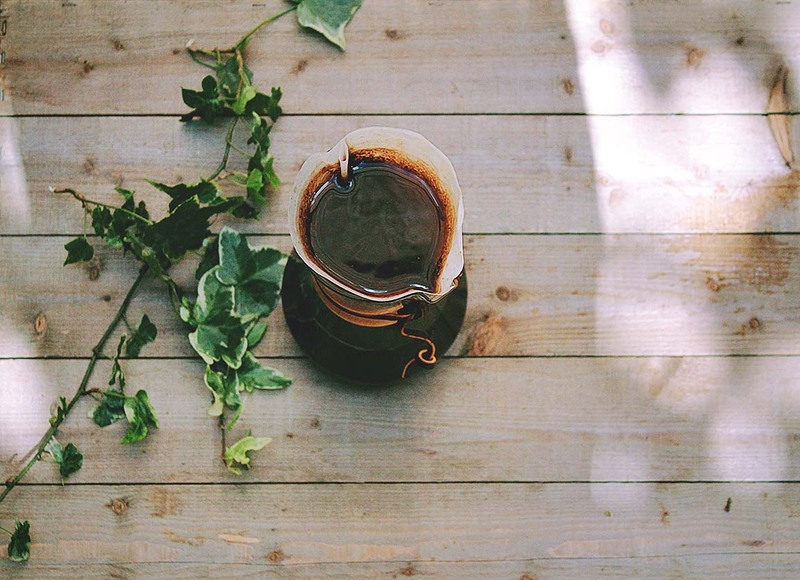 Add your ground coffee and your hot water making sure to coat all of the grounds and use around 150g of water. Go ahead and stir everything gently. At just shy of one minute go ahead and add 450g of water. 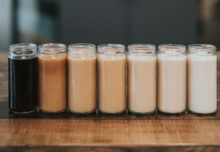 Pour very slowly and make sure that you pour where the mixture looks the darkest. Just shy of 2 minutes go ahead and pour the rest of the hot water in until you reach about 700g. 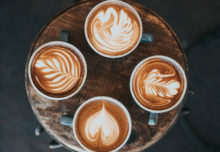 When you’ve hit around the 4 minute mark go ahead and pull your filter and grounds and discard. 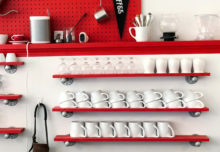 Now, you are ready to serve and enjoy!